This is a small representative of the various sects in the Message, most of which don't talk to each other. There is also the "Seven Thunders" movement, the "Bride Coming" group, and those that simply follow charismatic or dominating local personalities. The Returned Ministry Sect is a group within the Message that believes that William Branham will rise from the dead to "ride this trail once again" to fulfill all of the visions that he didn't fulfill during his first lifetime. Vaylism Lee Vayle taught a number of heretical doctrines including the Parousia doctrine, the denial of the deity of Jesus Christ and espousing Adoptionism (also referred to as Dynamic Monarchianism). These doctrines are remarkably similar to some of the foundational beliefs of the Jehovah's Witnesses. 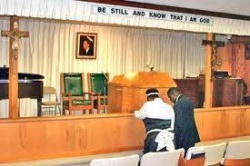 Golden Dawn Tabernacle is one of many message church in Tucson, AZ. The pastor, Isaac Noriega, was described by a former Golden Dawn member as "a very angry, bad tempered man...I remember him yelling at the deacons and anyone else who crossed his path...He would not hesitate to disrespect you." At Golden Dawn, the pastor runs your life, and you are not allowed to even fellowship with Message Believers from other churches. Voice of God Recordings The Voice of God Recordings, Inc. (VoGR) is a U.S. non-profit organization based in Jeffersonville, Indiana that is controlled by William Branham's sons. During the year ended June 30, 2012, VoGR received revenues of almost USD $10.4 million. Present Truth Ministries ("PTM") is a group that advertises itself "as non-denominational ministry dedicated to bringing the gospel to Muslims and supporting the persecuted church in the Middle East. PTM was founded in order to spread the message throughout the world." But are they who they say they are? Question 1: Are you lukewarm, and in the Message? Lukewarm people attend church regularly. It's what "good message believers" do. Lukewarm people tithe because they are required to but they don't give money to anyone other than their church. They also give offerings but only to the extent it doesn't impinge on their standard of living. Lukewarm people choose what their minister says over what is right when they are in conflict. Lukewarm people don't really want to be saved from their sin; they only want to be saved from the penalty of their sin. Lukewarm people are moved by stories about people who do radical things for Christ, yet they do not act. Lukewarm people say they love Jesus, and He is, indeed, a part of their lives. But only a part. They give Him a second of their time, money, and their thoughts, but He isn't allowed to control their lives. Lukewarm people will serve God and others, but there are limits to how far they will go or how much time, money, and energy they are willing to give. Lukewarm people think about life on earth much more often than eternity in heaven. Lukewarm people are continually concerned with playing it safe; they are slaves to the god of control. Lukewarm people do not live by faith; their lives are structured so they do not have to. Question 2: Do you have a charismatic, but dominating pastor? Find out more on the dangers of this situation. This page was last edited on 25 August 2015, at 04:33.